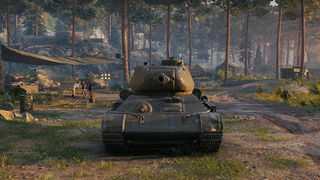 Der T-34-85M ist ein sowjetischer premium mittlerer Panzer der Stufe 6. Eine Abwandlung des Panzers T-34-85, die in der Fabrik Nr. 183 gebaut wurde. Anders als das Ursprungsfahrzeug hatte sie eine verbesserte Frontpanzerung und weniger Heckpanzerung. Die Treibstofftanks wurden vom Kampfraum ins Hecks verlegt. Da sich das Laufwerk als fehleranfällig herausstellte, wurde die Produktion bereits nach dem ersten Prototypen eingestellt. 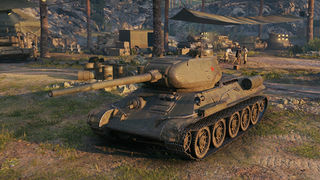 Plays very similar to the in-game T-34-85 with the mid gun. The front armor is much thicker than the stock tanks with the same sloping, allowing a surprising number of bounces that the standard T-34 would have eaten. A lot has been made of the weak penetration on the gun, but as a medium and flanker/opportunist it has adequate penetration, similar in fact to American counterparts in it's tier. As the historical description alludes to, the suspension/tracks were the weak point, making this tank slightly less mobile than the standard -85. This makes turning and maneuvering seem sluggish, although if you are using it as a crew trainer for your upper-tier crew the added skills and perks should mitigate this. As to crew training, the tank contains the same crew slots as the regular -85. This means if you've left the low tiers behind you will have to find a Radio Operator to fill that slot. All in all this tank plays like the E2 version of the Sherman, whereas the regular T-34-85 is closer to the E8. 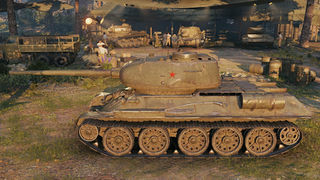 The T-34-85M also does not have Special Match-Making like other Premium tanks. Diese Seite wurde zuletzt am 2. April 2017 um 12:20 Uhr geändert.